Where is H. P. Lovecraft’s Innsmouth? They help to establish where I believe Lovecraft intended to Innsmouth to be, based on the use of non-fictional locations. “… directly from ancient Newburyport to Arkham …” – Somewhere around Newburyport. “… No railroad now—B. & M. never went through, and the branch line from Rowley was given up years ago …” – Somewhere near Rowley. “… Everybody trades mostly here or in Arkham or Ipswich …” – Somewhere near Ipswich. “I took a seat far behind him, but on the same side of the bus, since I wished to watch the shore during the journey.” – Innsmouth therefore must be south of Newburyport, since the driver’s side of the bus will be facing toward the shore. “… passing the Lower Green and Parker River, and finally emerging into a long, monotonous stretch of open shore country.” – Innsmouth must be farther south than the Parker River. “Out the window I could see … the sandy line of Plum Island, and we presently drew very near the beach as our narrow road veered off from the main highway to Rowley and Ipswich … At last we lost sight of Plum Island and saw … the open Atlantic on our left” – Innsmouth must be south of Plum Island. “Then we … beheld the outspread valley beyond, where the Manuxet joins the sea just north of the long line of cliffs that culminate in Kingsport Head and veer off toward Cape Ann.” – Innsmouth must be north of Cape Ann. 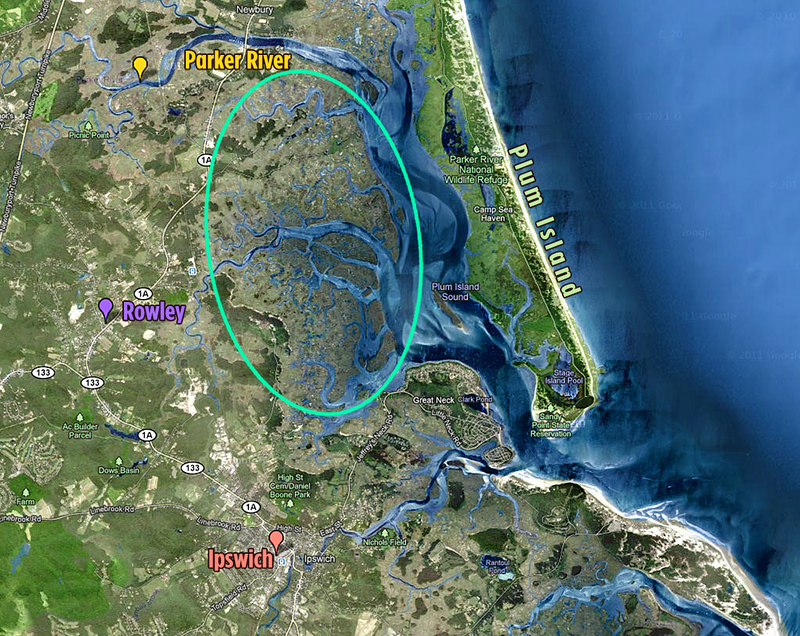 Therefore, cross-referencing the non-fictional locations, I believe Lovecraft intended Innsmouth to be in the marshy area east or east-north-east of Rowley, though possibly as far south as just northwest of Great Neck. Orange – the Parker River. Plum Island is to the east. Cape Ann is to the southeast, and not visible in this map. I believe Innsmouth to be in the marshy area just north of the center of this map. Possibly as far south as to be just north of Great Neck. EDIT: Somewhere in the teal oval. Note that the location of Plum Island conflicts with my probable location of Innsmouth – I believe this to be unavoidable, with the preponderance of evidence suggesting this location, despite Plum Island. I give thanks to Google Maps, without which, this research would have been much more difficult. Version 2.0: Map edited for clarity and contrast, Oct, 2015. Author Staff WriterPosted on August 13, 2011 October 30, 2015 Categories AnnotatedTags HPL, Innsmouth, Lovecraft, Lovecraft Country, The Shadow Over Innsmouth3 Comments on Where is H. P. Lovecraft’s Innsmouth?